In the movie "The Sandlot" there was a massive dog called "The Beast" who was rarely seen but still managed to terrorize the neighbourhood kids. But under The Beast's imposing exterior lay a soul of a brutish but good hearted companion. And today's 1965 Chevrolet K20 is The Beast in automotive form. This gnarled 4x4 certainly has a personality. Comparing this truck with a shiny, new F-350 bro truck would be like comparing a scowling Clint Eastwood from Gran Torino to the punk kids in the same movie whom he loathed so much. 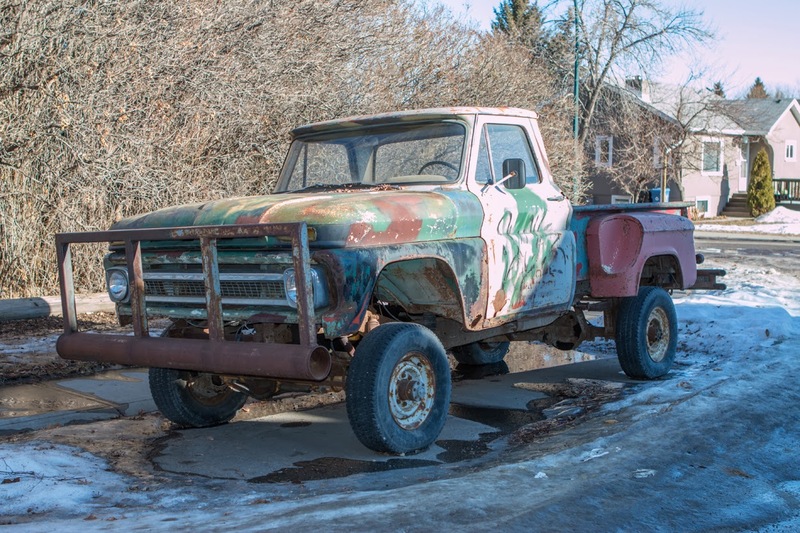 These kinds of vehicles often disappear from public view due to neighbour complaints about lowering property values and unsightliness but judging by the 15 foot wall of tangled branches forming this guys yard, he probably just doesn't give a damn. I can only hope this fearsome rig is piloted by some grumpy guy in faded T shirt while smoking a cigarette. 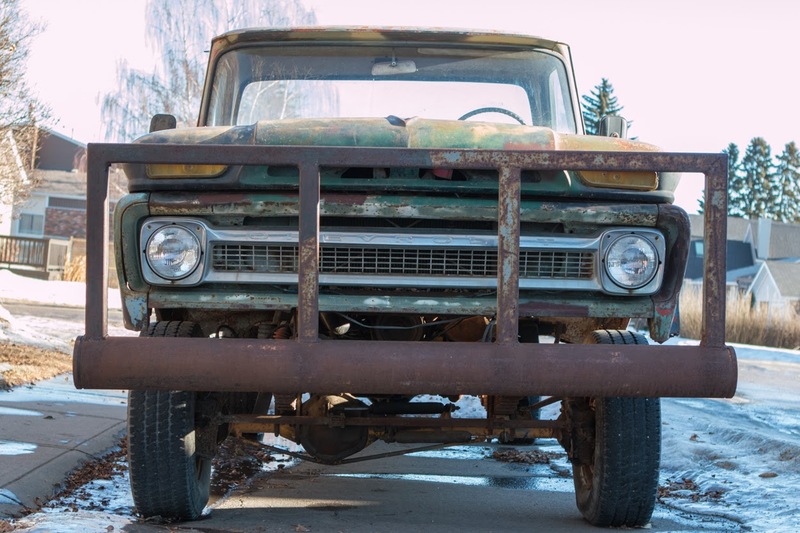 The Chevy K20 designed to work for decades without complaint. This truck is powered by a 220 horsepower 327 cubic inch (5.3 liter) V8 backed by a wimps-need-not-apply three-speed manual transmission and a beefy transfer case. Most of these were bought by hunters and tradesmen who needed a reliable vehicle to take them into the backcountry. 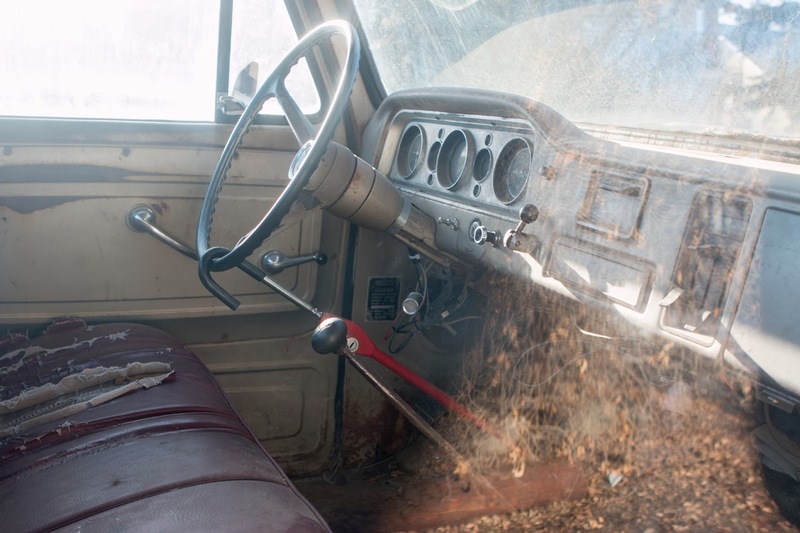 The interior of the K20 is designed for work, not comfort. The vinyl bench seat was made to be easily cleaned and hard to rip, all the controls are made of metal and large enough to use with gloved hands. But 49 years of hard use have taken their toll on The Beast. It's anyone's guess as to what variation of Chevy small-block V8 powers it now but with such a multicoloured exterior, you can well assume that the drivetrain has plenty of mix and match mechanicals. Every panel on it has surface rust and some panels have rusted right through. 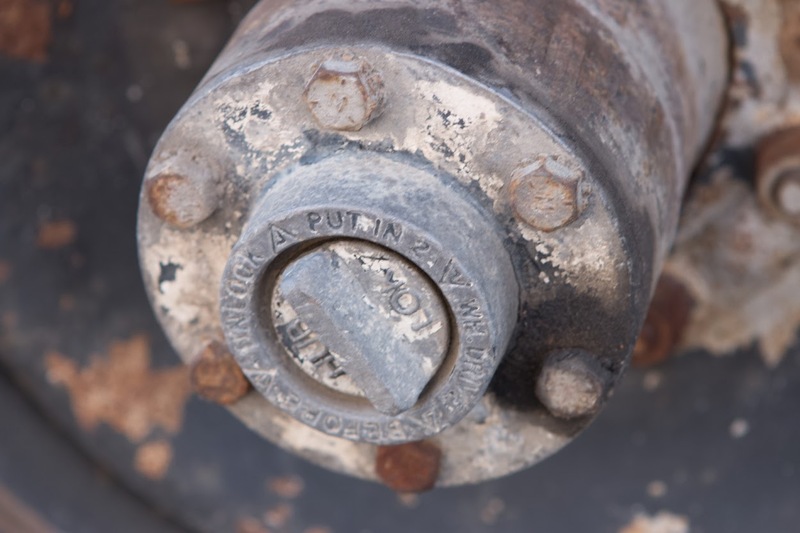 There was a time when parts could be found easily for this rig and the owner certainly took advantage of that. 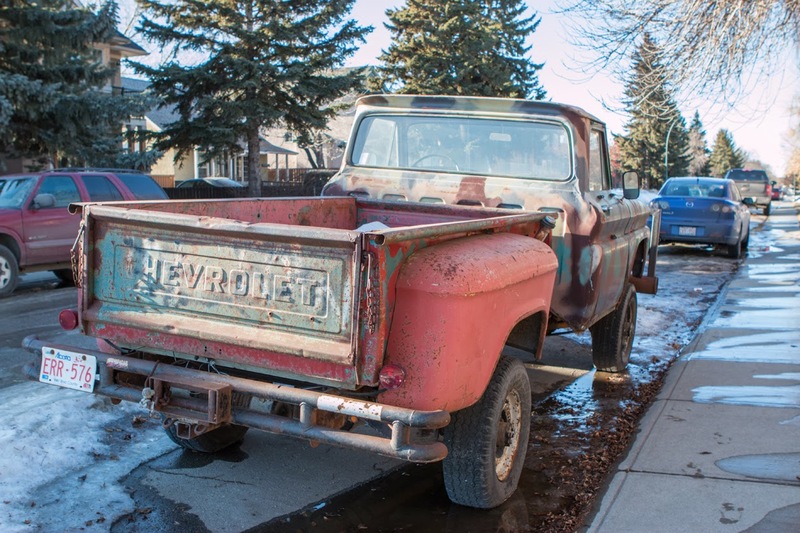 Seems like he didn't bother repainting the new pieces as he replaced them to create this rusty Chevy truck collage. Now that's art. Judging by the color of the cab, this truck was originally white. 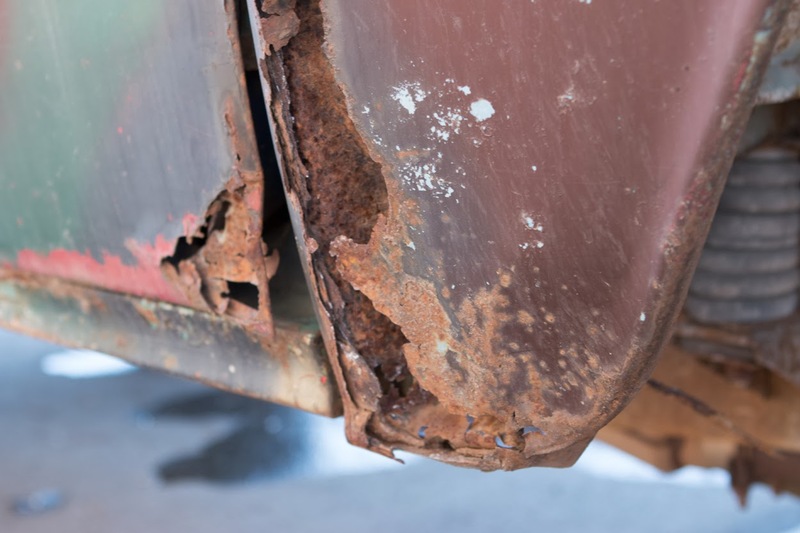 This is automotive archaeology at its finest. There's official looking stencil writing on the doors covered by black graffiti and the graffiti was haphazardly painted over with green paint. The hood bears signs of an ancient camo paint job as does the rear of the cab. Ex-company truck turned hunting vehicle? 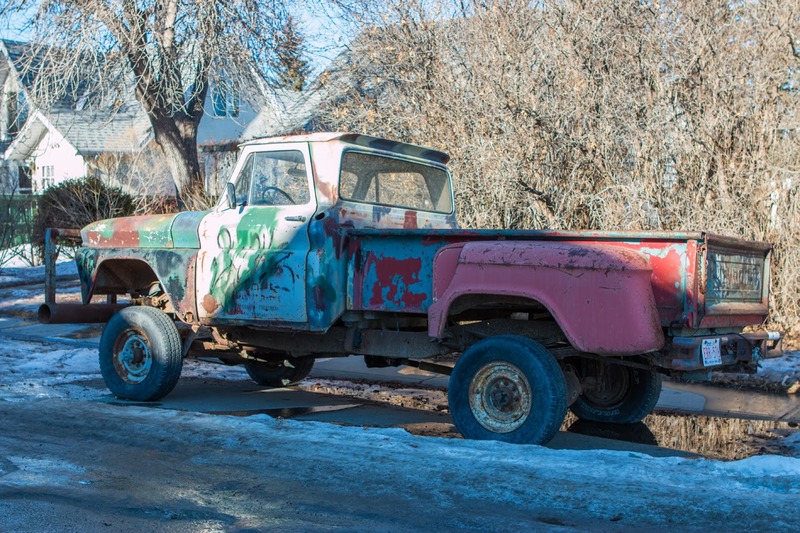 I'll have to stop by this house again to try and find the owner but in the meantime, it's entertaining to think of all the adventure this truck has seen. After reading your blog about The Chevy K20,I so want to take its ride.I know it would be so much fun.But I don't know how to make it possible in reality.